Harvard SECON: how do we create enabling environments for entrepreneurs? 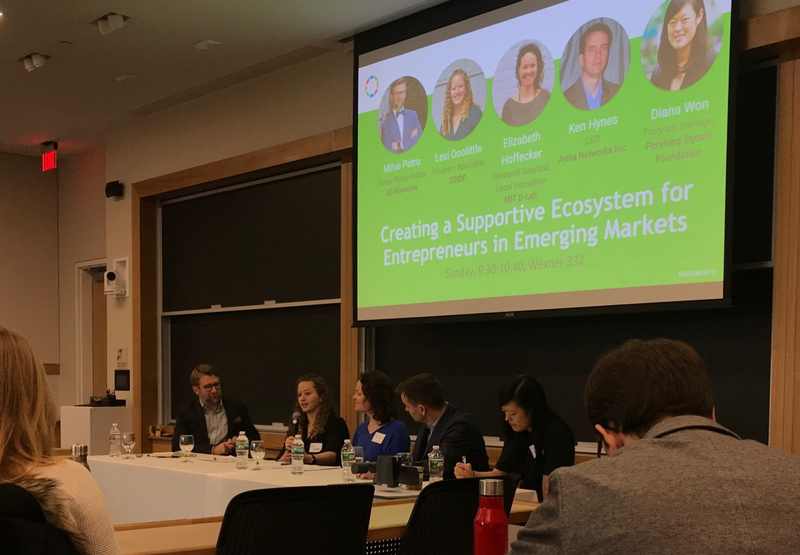 From magic wands to the often-zero-sum game of prioritizing breadth (scale) over depth in programs, we explored it all in our March 2019 Harvard Social Enterprise panel on Creating Supportive Ecosystems for Entrepreneurs in Emerging Markets. The panelists were from S3IDF, MIT D-Lab, ARTHA Networks, Pershing Square Foundation, and UC-Riverside and explicitly sought to create a conversation that would explore how different types of stakeholders forge partnerships and actively create entrepreneurial*/business/innovative** ecosystems in developing economies for sustainable*** positive social/financial/environmental impact. As is so often the case in the development sector, when framing our panel topic, we had such an excess of buzzwords that could each mean so many different things that we needed to define them to have a sensical conversation. For each asterisked word we identified our particular definition to ease conversation and comprehension. *Entrepreneurial included both the strengthening and scaling of existing businesses/cooperatives/partnerships, and the creation of new businesses. **Innovation in this sense didn’t necessarily mean the newest app or flashiest tech, but rather a shift from the prevailing practice that allowed for more efficient, effective strengthened businesses and deep and lasting social impact. ***Sustainable here focused on the systemic impacts of building these ‘ecosystems’ and how our work-streams are building the foundation for perpetual impact, as well as building in the sustainability of the business models (with direct implications for the ecosystems). We sought to create a cohesive, centered dialogue that illuminated the logistics, nitty-gritty processes, and lessons learned of ways in which different players have engaged in entrepreneurial ecosystem facilitation activities. As panelists, we represented a small non-profit, a large academic institution, a network, and a foundation, yet despite our methodological diversity, our conclusions on the challenges and opportunities for the space were closely aligned. General time horizon expectations for building supportive entrepreneurial ecosystems need to be much longer (minimum 3 years, but decades would be better). The government has a powerful role to play in facilitating those ecosystems (with potentially negative and positive implications depending on the degree of facilitated trust and efficacy). Many of the entrepreneurs we’re each working with don’t really see themselves as such and are often only entrepreneurs by necessity, not choice. Being a facilitator is rather unsexy (very few are willing to fund/prioritize entities who identify as a ‘go-between’ despite the incredible value such an entity can have). We also broadly aligned in our identification of what we would do if given a ‘magic wand’ to address some aspect of the entrepreneurial environment strengthening. Most of our responses centered on increasing community trust, positive perception and engagement in the work, with an extra plea for broader recognition of the value of facilitation work. With anecdotal and quantitative evidence, sprinkles and dashes of on-the-ground reality checks and wry humor, we fostered a positive conversation between ourselves and our audience that will hopefully propel forward the creation of supportive ecosystems for entrepreneurs in emerging markets. To learn more about S3IDF’s magic objectives, real work, and ideas connect with us at future events, and sign up for our newsletters! Lexi Doolittle of S3IDF, Elizabeth Hoffecker of MIT D-Lab, Ken Hynes of ARTHA Networks, Diana Won of Pershing Square Foundation, and Mihai Patru of UC-Riverside.